Jennifer Katona, lecturer and director of CCNY's graduate program in educational theatre, has won the Lin Wright Special Recognition Award from AATE. Jennifer Katona, lecturer and director of The City College of New York's graduate program in educational theatre, has been named recipient of the American Alliance for Theatre and Education's Lin Wright Special Recognition Award. 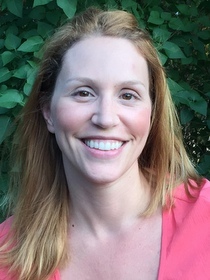 She will receive the honor at AATE's 2015 national conference in Milwaukee, Wis., August 5-9. The award recognizes individuals that have furthered theatre and drama for young people by establishing special programs, developing experimental work, making a distinctive educational contribution, or providing meritorious service. Katona launched and developed the educational theatre program in City College's School of Education from eight students in 2007 to more than 85 at present. The program is innovative in its teaching as candidates gain hands-on experiences through partnerships in the community. Under her leadership, the program has forged partnerships with both schools and community based organizations in upper Manhattan. These include PS 161 near CCNY's Harlem campus, where Katona established an afterschool drama program in 2010. Since 1847, The City College of New York has provided low-cost, high-quality education for New Yorkers in a wide variety of disciplines. More than 15,000 students pursue undergraduate and graduate degrees in: the College of Liberal Arts and Sciences;the Bernard and Anne Spitzer School of Architecture;the School of Education;the Grove School of Engineering;the Sophie Davis School of Biomedical Education, and the Colin Powell School for Civic and Global Leadership. U.S. News, Princeton Review and Forbes all rank City College among the best colleges and universities in the United States.